Attracting new patients requires enhancing your practice’s online presence across multiple digital channels. Most Doctors nowadays understand the importance of a strong online presence for getting new patients and retaining existing ones. Easy availability of information online has changed the way patients decide on a treatment, empowering them to conduct their own research and make their own decisions when considering treatment options. However, it’s important to understand that to increase online presence doesn’t mean simply putting up a website and a few digital ads. Making your presence in Local SEO is equally important. When a patient is looking for doctors in a particular locality or for a particular specialisation these days, it always starts with searching in Google, Yahoo, or Bing with keywords like “General Physician near M.G Road Pune” or “Orthopaedic in Andheri West, Mumbai”. Thus, it is very critical for every Doctor to claim local listing in search engines like Google, Yahoo, and Bing. These search Engines will display the information that you shared when patients in your area search. Advantages: A) Google is the world’s largest and most powerful search platform. B) Google has no vested interest when it shows doctors to patients. Paid listings are clearly marked as such. C) Google reviews can not be manipulated thus enjoy credibility among users. JustDial is the largest listing platform in India, with 16.3 million listings and 68 million reviews. It provides search services on web, mobile, phone and SMS. They have listing services for Doctors as well based on location and have the best reach in tier 2/3 towns in India. Advantages: A) Largest database of doctors in urban as well as rural areas B) Widely used service for any consumer needs, thus already well-known to people. Disadvantages: A) Conflict of interest as it must show the paid listings higher than the better-rated listings. B) JustDial is also known to show geographically irrelevant entries e.g., search for a doctor in your town may show a doctor hundreds of miles away. 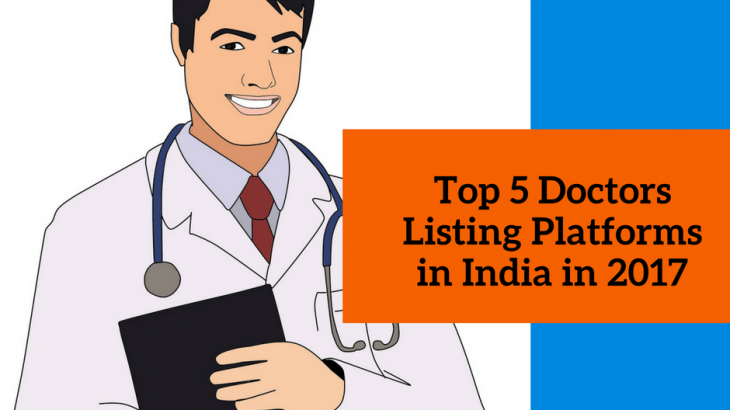 Online doctors listing service that covers about 58 cities & towns in India. It also provides appointment booking online for doctors that use its software. Advantages: A) It’s specialised in doctors search B) Many urban patients are aware of it. Disadvantages: A) Conflict of interest as it must show the paid listings higher than the better-rated listings. B) It invests heavily to ensure patients keep coming to it every time they have a medical need. This means patients who come to you via practo may go to another doctor in future (via practo) based on many factors. Find doctors in India and consult online with them for any kind of medical assistance. Ask health queries, book appointment and get useful health tips. Advantages: A) It begins with patient’s query and some engagement with doctors, therefore conversions are more likely. B) It’s specialised in doctors search. Disadvantages: A) It invests heavily to ensure patients keep coming to it every time they have a medical query. This means patients who come to you via Lybrate may go to another doctor in future (via lybrate) based on many factors. Refadoc focuses on helping people find the right doctor around them and the larger picture is to provide unbiased reviews by other patients. Advantages: A) Refadoc is primarily a patient-focused portal to share reviews, thus enjoys good credibility. B) No paid listings, therefore no unfair advantages for anybody. Disadvantages: A) As of now, it lists doctors in 18 cities only. Objective of any listing platform is to hook the consumer so that each time the consumer needs that product/service they should come to the platform. As a doctor, however, you wouldn’t want the patient to keep going back to the platform. Thus, you must take care that you treat the patient well, so they stick around with you. Build a personal touch in all your interactions. Never share your existing patients list with any listing platform. This happens if you use a patient management software provided by the platform. In that case, you are keeping your entire patient data with them and are hurting your own interests. You are ‘giving’ your patients to the platform to be contacted by them directly (which is what most of them do!) to promote themselves, ‘unhook’ them from you, hook them to themselves – sell them medicines, sell them online consultations by ‘other experts’ etc., Obviously the ‘other experts’ have to pay more to the platform. Never send your patients to any platform to book an appointment. They’ll always show other practitioners in the same area, often those with ‘better ratings & reviews’. This diverts your patient’s attention to other practitioners. Needless to say, the ‘other practitioners’ have paid more to the platform. Further, nothing stops the platform from contacting your patients directly, to promote the ‘other practitioners’. These listing platforms promise the first-page to every practitioner who buys paid listing but obviously can show just 6-8 on first page. Others will invariably go on other pages. When those on other pages complain, they are told to pay more to come on first page. Ultimately, practitioners will be competing with each other and filling the pockets of the platform!! Don’t use the same provider for the listing platform and for practice management software. Use separate providers. When listing platforms promise new patients, try it out for a couple of months and then extend every two months if you indeed get new patients. Do NOT pay for longer term. Try multiple listing platforms on the same basis. Convert your patients to your ambassadors. Use a practice management software which helps you do that. Such software shouldn’t have its own listing platform so that there’s no conflict of interest. So, to safeguard your long-term interests and to strengthen your own standing, doctors should enter their existing patients’ data in only such software which does not have a listing platform. To get new patients, they can certainly experiment with all listing platforms and continue based on results.